We’re back from EasterCon, which was an excellent mix of meeting up with old friends and making new ones. My most excellent writer friends Kari Sperring and Juliet E. McKenna were instrumental in this year’s EasterCon, so I’m particularly happy that it was this year I finally got to *go*. All the other committee members I met were also wonderful people, and they did an absolutely fantastic job putting together a magnificently diverse and interesting program. The past few years EasterCon’s had a commitment to gender parity on the panels, and I was actively aware every time I got up on a panel that I wasn’t the only woman on it. As it happens, the Irish conventions, P-Con and Octocon, are very very good about gender parity (not because they had a Plan, but just because of the general participants), so it wasn’t a new sensation, but since EasterCon is a much larger convention, it was wonderful to see that parity being pursued. Well done on that front! Also, holy beans. As usual, I managed to go to exactly no panels I wasn’t *on*, but the ones I was on were some of the best panels I’ve ever gotten to participate in. Part of that was due to moderators who came prepared and actually did their jobs, on every single panel, making certain that everybody got a chance to talk and nobody completely hogged the spotlight. The rest of it was due to just utterly terrific topics and panelists who were engaged and enthusiastic about what they were there to discuss. Also! Because I am accustomed to tiny Irish conventions, it was noticeably different that the audience didn’t regard the panels quite so much as…conversations in which they were fully expected and indeed entitled to participate in. Which isn’t to say they didn’t participate, because when presented with the opportunity they did: good questions, good comments, good anecdotes. But there was far more sensation of “We’ve come to hear what you experts/professionals/panelists have to say on this topic,” rather than, “But more importantly, here’s what I have to say on it!” So (with no disrespect to the Irish conventions, because I love the informality and the give-and-take of those panels) that was a refreshing change as well. The panels, the panels! The panels were so terrific! I moderated two on Friday evening. One was about superheroes on film, which brought forth a fair amount of discussion on what makes them work and what makes them fail (not to pick on Green Lantern, but we picked on Green Lantern), and which had some pretty good insights, particularly about how part of what’s made the Avengers work is that they avoided one of Green Lantern’s big faults: they’ve introduced each radical new hard-to-believe element separately, so by the time we got to aliens at the end of Avengers it was like OKAY WE CAN HANDLE THAT! We talked about why the hell Hollywood can’t get a Wonder Woman film off the ground (because girl cooties, apparently), and what superheroes we’d like to see on the big screen (Black Adam is the only one I remember off the top of my head). The next panel I moderated was “What are you reading in graphic novels?” which had to be the easiest moderation ever. Which is good, because it was at 9pm on a day I’d gotten up at 5am. o.O But anyway, basically all I had to do was sit back and say, “Oh yeah? Ooh that sounds good,” and, “So how about you, what are you reading?” I recall the titles Sleeper, Chew, Rachel Rising,…apparently I remember everything panelist Stephen Aryan suggested, and very little anyone else did. And know what else I did? I thought, “I don’t need these,” and ditched my papers that had all the titles they’d talked about on it! I’ll have to email them and see if I can’t get their lists again, because they had some really good stuff. Grim and dark stuff. We ended up the panel doing a rush of suggestions of not-grim-and-dark, which included Bone, Digger, ElfQuest, and er well sort of Strangers in Paradise but er well not exactly too, and other things I’m also failing to remember. I did take some notes on my phone, so I’ll go dig those out later. My first panel on Sunday was the one that blew the others out of the water, and the others, as I've said, seemed to be at a pretty high mark already. But this was one asking why the future was so white, and what responsibilities writers did or did not have toward changing that. This could have gone really, really badly. Someone could have come in with a bone to pick or a cross to bear, and it could have turned into a bitter, monopolized soapbox of anger. It could have been all about condemning the past and not looking toward the future. It could have been just awful. Instead it was amazing. The panelists were Aliette de Bodard, who is a French Vietnamese writer (by way of the USA), a British Asian screenwriter, Tajinder Hayer, a writer who I believe said she was Afro-Caribbean in descent although, in her words, she comes in on the lighter end of skintones in her family and is often regarded as white (ETA: author Stephanie Saulter!, and another man who I believe was also of East Asian descent. And me. :) (I’ll get everybody’s names and link to them once the con is officially over and all my poor friends have had a chance to sleep!) Everybody came in with the intention of having a great discussion, and wow, we really, really did. …well, part of the discussion came around to Steven Barnes’s Aubrey Knight books. One of our panelists had read STREET LETHAL when it was released in the UK, but saw the sequel, GORGON’S CHILD, in the US, where it had a black man on the cover. He was astonished because he’d defaulted to Aubrey being white, and upon re-reading the book, thought there wasn’t much in the book to dissuade a reader of that assumption (which was a topic we barely touched on, the elliding of color to make a character more palatable even in the prose of the book). *I* remember GORGON’S CHILD coming out (later than I’d thought: I was about 16, not 12), and I bought the book *because* it had a black person on the cover. I’d never seen a fantasy novel with a black protagonist, and–I don’t even know exactly what I thought, except something along the lines of, “Holy crap, they write fantasy novels about black people too? !” and bought the book. So if a 16 year old white girl from rural Alaska whose experience with ethnicities beyond Native Alaskans was extremely limited was happy, even delighted, to discover a book whose protagonist was visibly not the default, it’s possible that the “white readers don’t read black protagonists” idea is pretty flimsy (just as perhaps “men don’t read women writers” is). White as default was a part of the topic, too, and one of the things that I thought was interesting was that everybody on the panel, none of whom identified as white except me and the moderator, all defaulted to white. It’s what we’ve all been trained to do: a blindness that has affected all of us as readers and, if we’re not careful about it*, as writers. Taj talked about his PhD thesis, which is looking into the presence of British Asians in SF/F. I don’t know how far he’s gone back, but he’s found, wait for it, four examples. Four. And I know he’s gone back to at least 1970, because he talked about one book (the title of which inevitably escapes me, and the details which follow may be slightly inaccurate on ETA: The Devil’s Children by Peter Dickinson! Thank you, coraline73!) in which a little (presumably white) girl becomes attached to a large Sikh family in a post-apocalypic situation. He said parts of it are quite good, but other parts read like a travel guide to Sikh culture and traditions: that the story would largely stop while things were described in careful detail. Then he broke out to say he specifically and particularly was *not* picking on the author, whom he thought was quite forward-thinking and groundbreaking for writing this story in 1970, and he allowed as how it was possible that forty years ago it really had been quite necessary to pause for the travel guide style narratives. And among other things, what that comment made me think of was how awesome it was that the panel wasn’t focusing on condemning the past, but was very much looking to the future. Oh, one of the really wince-worthy moments was Aliette talking about–she writes stories, among other things, about Vietnamese space explorers–talking about being told that her human Vietnamese characters were some of the best aliens the reader had ever encountered, and that someone had begun busily deconstructing the language she used in those stories to see if it held up linguistically as a constructed language. The language being, of course, Vietnamese. I think everybody on the panel winced at that. The man who wasn’t Taj (I look apologetic and wish I had everybody’s names!) made a point about the difficulty of writing other cultures and ethnicities without being, or being accused of, being patronizing. (Another aside: I love how the British say patronizing. It sounds, well, so freaking *patronizing*. *laughs*) So we touched on that: on whether white writers had the *right*, as it were, to try writing other ethnicities, and the question was raised about whether it was easier for white writers to write other ethnicities than it was for other ethnicities to write and publish (well, anything, but specifically in terms of the question) white characters. I’m not absolutely convinced of that, given the run-around I had to go through in order to keep Margrit as she was, which is to say, a self-identifying black woman with two parents who also self-identified as black. But: it was a great question and one of many we didn’t fully have time to pursue. Indeed, this was the one panel that when they said time was up we all really sort of went, “But…!” The entire panel moved out into the hall and kept discussing the topic with each other and with some attendees who wanted to continue as well, for about forty minutes after the panel was over. And I’ve barely scratched what we talked about. It was really an absolutely terrific panel, and I’m so pleased that I got to be on it. The only character I ever actually thought about in terms of ethnicity in that way is Alisha MacAleer in the Strongbox Chronicles. Alisha’s specifically *not* just whitebread, despite her Irish last name: her mother’s side of the family is Hispanic. I needed a character who wasn’t glaringly white, because she’s a spy, and I needed her to be able to blend in at least a little into non-European cultures. Alisha is one of the rare characters I came anywhere near mentally casting, and in my mind she’s kind of somewhere between Alex Kingston and Julianna Margulies, only not exactly. I really never thought about Jo as being “not white” so much as I think of her as being “half Cherokee,” and Margrit arrived in my brain rather like Artemis springing from Zeus’s forehead: fully formed and confident of who she was. I certainly knew she wasn’t a white woman, but I didn’t set out to write her as a black woman because I was making a statement so much as that was just who she was, and who was I to argue with that? I'm glad it was a big success and you had such a good time! Cons are either fab or a bomb, usually. I would have bet that Jim is one of the good ones. Sadly, the closest I've gotten to him is chatting with Harry Dresden on Twitter. Aha! Having known you for *mumblety*ohgoditIS20someoddyearsnow*blanch*, I was wondering how you knew him. 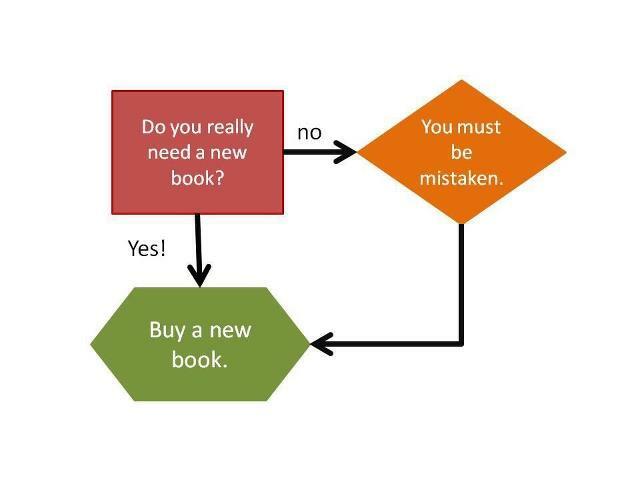 loved the book buying diagram. You were more confident than the committee then. On the other hand, they did everything they could think of to be ready for any eventuality, including the member having a heart attack in room 307 or thereabouts (Ted was the one who paid attention on the Friday morning), and as far as I can tell (having left about a day earlier than we wanted), they got it very right. The report I heard was that the hospital cardio guys said "Oh good, we got this one very early". And the guy was back at the convention about 48 hours afterwards. Was the post-apocalyptic book with the Sikh family be the first one of Peter Dickinson's 'changes' trilogy, 'The Devil's Children'? I think it was first published in 1970. Yes! I remember the author's first name was Peter, so yes, that must be it! One of the things notable about The Sarah Jane Adventures was that it was trying to show Britain as modern kids growing up in the country will encounter it. So of its Scooby Gang, you have Sarah Jane (the adult, who was an original Doctor Who companion character, so white), her 'son' Luke (also white), his friend Clyde (black), and his other friend Rani (Indian, and her dad is a school headmaster). It's a good example of how some of the best exemplars are in the YA part of the genre. It's a real shame Liz Sladen died, because without her as Sarah Jane, the series really couldn't continue. “Jim’s a friend of mine!” I said cheerfully to the guy looking at the book. “Want me to sign that for you?” “Sure!” he said, and so I did: I am not Jim Butcher. Americans pretty much use “Indian” for that ethnic designator (particularly since Native American has largely replaced “Indian” for, well, native Americans), and that “Asian” to Americans means Chinese, Japanese, Korean, Viet Nam, et: Western Asian, from a British appelation perspective. The whole "Asian" vs. "Oriental"--which I've been referred to as--in British English vs. North American is yet another example of division by common language. I personally fail to be offended by either used innocently but understand when people do get offended themselves. The language being, of course, Vietnamese. it was a great question and one of many we didn’t fully have time to pursue. It is an interesting question and harder than it sounds at first, although I feel like framing the question in terms of "right" isn't as useful as asking what the hurdles are both in doing it well on the one hand and getting it published on the other. I think you're correct in that "right" isn't exactly the most useful word, and certainly Aliette touched on the fact that she'd read books where there was a Vietnamese character and that frankly, she found nothing in common with her experiences as a Vietnamese woman and this character's, um, portrayal? of being Vietnamese. Mike Carey (another splendid fellow) has just done a blog post about cultural appropriation and similar aspects of writing that I think is very good. Sounds like a most excellent con! Was the panel on race the one Jo Fletcher Books blogged about? (http://www.jofletcherbooks.com/2013/04/eastercon-2013/) I imagine it must have been! Goodness, yes. Thank you for that illuminating aside; I was completely confused. The whole thing sounds like QUITE the experience! I was too when it came up on someone's blog a couple weeks ago--a Brit was asking what Americans would call "East Asians"--and I was totally o.O over it all. I've been over here most of a decade now and had no idea of that particular appelation!